When Baby G turned one I had such a creative celebration in my head but, with one thing and another, it never really materialised. His show-stopping farm themed cake will have to wait for his second birthday but, despite my lack of creativity making loads of things, what I did do seemed quite effective. I bought a small cardboard number one from a local craft shop and pained it blue. Then I just put some daffodils in a vase and wrote George is One on a little chalk board easel I already had. Then came what can only be described as my light bulb moment-I raided the toy cupboard, his bedroom and the living room for every large scale vehicle he has. Being one, he hasn’t got as many as an older child but he isn’t doing bad. I either washed or wiped them and set them on the table. I then used them as food holders. Genius. 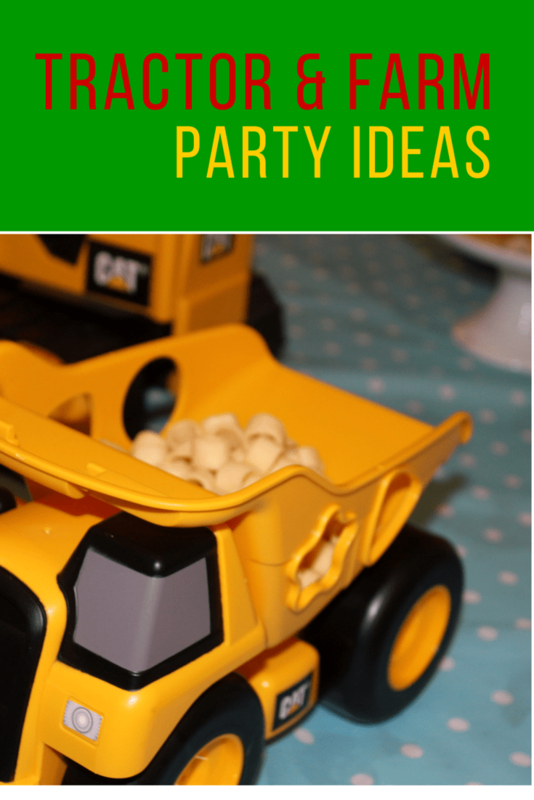 So the John Deere dump truck held baked potatoes-just as a real one might move potatoes from the fields. The CAT plough housed tractor wheels (Oreo cookies). Then the CAT tripper truck held grain (crisps) which even Boo was impressed with. I feel happy that my boy has a whole year to acquire many more toy tractors to be used for his second birthday and I have the same amount of time to plan his cake. Brilliant idea! I remember once doing a beach themed lucnh for the children and using sand moulds to put the food into, they loved it.